The Northwood Alliance has long acted as an advocate for the local communities by educating, strengthening environmental networking and assisting in local action. The below initiative was approved by the NWA board in 2007, with agreement that 10 years of stability in the group would lead to NWA acquiring lands for conservation. 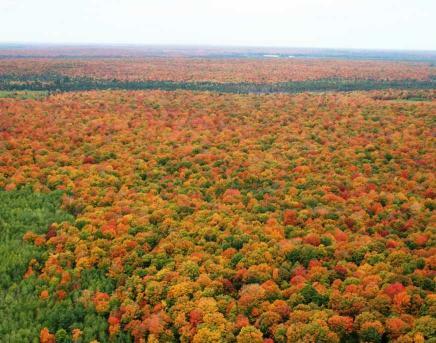 One of the top conservation concerns in Northern Wisconsin and the Upper Peninsula of Michigan is the parcelization of forestlands and the pursuant development, largely consisting of second homes. This trend not only threatens the ecological communities of the area, but stands to change the way of life for residents and visitors alike. A glimmer of hope lies in the activity of local land trusts. These organizations work with land owners on land protection agreements, called conservation easements, to develop a land use strategy with conservation as a primary goal. When executing a conservation easement the landowner will usually donate the development rights to a land trust, receiving a tax deduction and assurance that development or fragmentation will be perpetually restricted on their lands. Many landowners who consider donating a portion of their property value to a land trust are not prepared for the costs they may incur, and this amount may in some cases offset their tax deduction amounts. These expenses may add up from the appraisal work, the baseline legal documentation, the monitoring fund, and so on. The Northwood Alliance, Inc. has designed a program in order to network and garner support from Northwoods conservation enthusiasts to help offset the expenses landowners may face when entering into a conservation easement. As a community education and conservation action advocate, NWA understands the benefits to a community when a parcel with conservation value is protected. Adjoining landowners may enjoy increased property values while sharing the long term tranquility and aesthetic values from their neighbors’ conservation choice. It is only fitting that benefiting members of the community support these efforts. Not only serving human needs, NWA recognizes the responsibilities we share in environmental protection, and the goals of the Land Conservation Initiative include habitat preservation, protection of ground and surface water, and biodiversity maintenance. The Northwood Alliance Land Conservation Initiative is not a land trust, but will act as a supporting partner to land trusts involved in our project locales. We value the relationship we have with Keweenaw Land Trust and the Northwoods Land Trust and with the members of the sustainable forestry community such as Partners in Forestry Cooperative. Please contact us for more information or with any questions. On request we will share specific locations and projects with potential donors and partners, and we welcome your suggestions. NWA will work to assist other conservation groups and land trusts in areas they well serve and work directly on land conservation in areas not well served by other groups. We believe in land conservation for the social, environmental, economic and intrinsic benefits to the public.